How has your week been?? I’m watching my northern hemisphere friends and their summer gardening and activities. It is cold and damp here and the last few days have been somewhat dreary and misty. The good side is that everything is lovely and green and just beautiful. 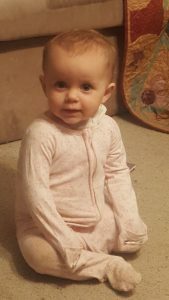 Our very special youngest granddaughter turned 1 this week. After I wrote last week our no 1 daughter rang us and asked us to look after the children for a night as they wanted to finish cleaning up and finally be done moving. We were thrilled to have the children and it’s always great fun. It got rather chaotic around tea and bath time but we managed and the team of grandparents and uncle and aunt worked well. They had a great time outside helping granddad with the animals and the fencing. This week has been good and my husband got back to work for a few days. He is very tired and still getting himself back to where he was before his chest pains. He is still having pains on and off and we have an appointment this week with the heart specialist. I think I may have told you we were doing a marriage course through our church and we’ve completed 2 weeks now. It’s always good to sit down and work on things even when they are going well. We’re being reminded about communication and what our spouses needs are and we get homework to do as well. There’s a range of couples in the group, some only married 6 months and some like us nearly 30 years. I had our book group meeting this week and it was so nice to get back together with the ladies again. We are up to Strategy 4 – Our Family and this was an excellent chapter. My friends it’s all about SPECIFIC – FERVENT PRAYER. We are learning to move on from the basic “bless my husband/family” prayers to recognising specific needs and problems and addressing them and taking them to the Lord. If you haven’t read Fervent I would really encourage you to do so. Our next chapter is “Our Past” and we all groaned over that one, but it’ll be good, maybe painful but always good to change and grow. 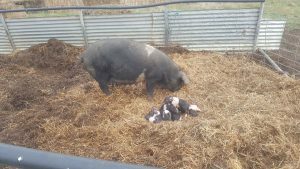 On the farm our Saddleback sow had her piglets and delivered 10 little cuties. They came overnight and she didn’t need any assistance from us (they never do – God’s got that sorted). These little ones will be grown to weaning stage and then sold or maybe a couple might hit our freezer as well. We have also been blessed with some fish for our aquaponics system so the men have been working on getting that back on stream after a fire in the sump. It was a blessing that we didn’t lose the shed – thank you Lord. We are waiting on cows to calve as well and we are really missing our fresh milk and I’m getting sick of buying it at the moment but they’ll come when they are ready. We had the graduation of one of my husband’s Good 2 Great Father’s Course on Sunday and it is always good to see Fathers improving themselves and wanting to become better husbands and fathers and it’s wonderful to see the families grow closer together. We had the graduation during church and then shared a meal together. It was nice to meet some of the families as I didn’t know a couple of them before this. Thank you everyone for stopping by and linking up, it’s always a blessing to me. This coming week is a bit quieter and I’ve got a couple more days at home. We’ve got our Marriage Course and then a whole day out on Wednesday with Doctors and then singing and piano lessons. The eisteddfod is only a week away now so it’s full on practicing for that. Our no 1 daughter is going to accompany the children in their singing so we’ll get to see her and the children on Wednesday when they get together for a practice. I’ve still got apples to bottle so I’ll be working on that when I’m home and I’m hoping to get my garlic planted this week and get on top of some weeding in the vegetable garden. The winter veg are growing nicely but I’d like to get some more seeds in this week. A reminder to us all to be strategic and fervent in our prayer life. Hey there my friends, it’s good to be back and I hope you are all doing well. Sorry about not being around last week but we had a rather full on week to deal with and by the weekend I just couldn’t get my head around doing the link up. Last Monday morning my husband was driving to work and had to stop because he was having crushing chest pains. Thankfully he was only 10 kms from home so he rang me and then rang an ambulance and the children and I went to wait with him. He’s never had this pain before and it was pretty full on so the ambulance took him to our local hospital and checked him out. 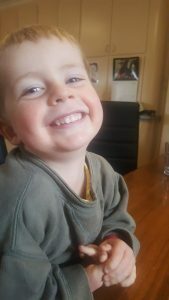 Thankfully nothing was showing up on his blood tests or the ECG’s which meant that no damage was being done to his heart. 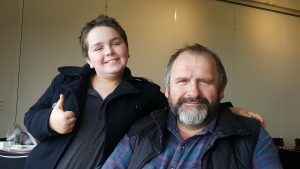 The pains and shortness of breath continued throughout the next couple of days and finally on Wednesday they decided to send him to a bigger hospital a couple of hours away where they would give him an angiogram to see what was going on. The angiogram was carried out first thing on Thursday morning and came back clear – there is nothing wrong with his heart. Praise God all was clear and he was home that night. That of course is the shortened version, let’s just say that my husband came to the point where he didn’t think he would ever come home, see our younger two grow up or see our no 1 son married. He thought that he wouldn’t see our no 1 daughter and son-in-law and their children again or meet the new one due in August either. I guess he gave everything that is important to him up, he was at a place where he realised that all he had was Jesus and nothing else. There was nothing he could do to stop or help what was happening – he was helpless. There were many prayers prayed and many prayers answered and I personally feel like I have been given an amazing gift and never want to lose the feeling of gratefulness that I have now. Grateful to God that He has left my husband here with us, grateful that our wonderful family pulled together in a very difficult situation. Grateful that our older daughter and our wonderful son-in-law care so much for their younger siblings that they could look after them for us. Grateful to our no 1 son who cared for me and drove me to Geelong and picked up the slack here at home whilst we were away. Grateful for an amazing church family that surrounded us with love, prayers and support and still continue to do so. I have so many things to be grateful for and I guess I am extremely grateful that God brought my husband to a place where he could only rely on Him, and it has made him even more committed to leading his family in God’s ways and teaching them to totally rely on Him. There has been talk of the heart issue being a spiritual attack and of the outcome being a mighty healing – God only knows but I know that He was definitely in charge of the whole situation and was working it out to our better good and my husband has come out stronger and closer to God – what an outcome. I must admit I had my times during the week, especially when I had taken the children home for a rest and I got called back in urgently because my husband was having another attack and wanted me there. That was the toughest trip in I’ve ever had and I am suffering separation anxiety but that is improving. I have a great desire to spend every moment with my husband holding his hand, but each day it is getting easier. He is still tired and is working on building up his strength again. He is having more tests and they have now found that he has gallstones so he has done a flush and passed quite a few, and he amazed the doctor that you could even do that. He will do another one in a couple of weeks and get another scan. They still aren’t ruling out his heart due to the pain that he had on the Monday – that definitely wasn’t gallstones, but both of us don’t want to discount what God did for him that week with giving him a clear angiogram. We are taking each day at a time and loving each other even more than what we did two weeks ago and getting back to doing what we were before all this happened but with a greater appreciation of God’s plan for our lives, for each other and our family. I won’t do a top three this week but it’ll be back next week. This coming week we’ll be trying to get back to normal, with work and school. The eisteddfod is only 2 weeks away now so it’s all on practicing for that. The children are working hard with their piano and their singing. My husband and I are doing a marriage course and we’ve got the 2nd session this week. I think it’ll be a really good one and we even get homework to do, and we need to do “marriage time”. The children have music lessons and we’ve got book group later in the week. We’re up to strategy 4 – our family and it’s a good section. I’m looking forward to meeting up with the girls again to see what they took from it. I’ve been watching all my Northern Hemisphere friends getting ready to plant their vegetable gardens after a long winter and it’s fun to see how they do it all. Here, where we are, we are waiting on some more rain and it’s been a dry summer and Autumn. We had some rain a week or so ago which was lovely but we really need some constant stuff to really make a difference. The summer vegetables are just about finished in the raised beds and I’m still getting a few zucchini and now I’m waiting for the pumpkin plants to die off so that I can pick the pumpkins and put them away until I need them. The Golden Nugget pumpkins that we grew are still going and are delicious, they would have to be one of my favourites and are lovely roasted too. We’ve got bags of apples stored at the moment and I’m slowly working my way through them. 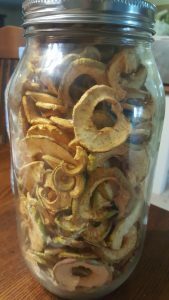 I’ve put some through the dehydrator and they are delicious and great snacks, and I’ve also bottled some stewed apples and run them through the Fowlers preserver (water bath method). I’ve got a few bags to go and want to knock as many off this coming week as I can. I don’t have to go out as much this week so I should be able to motor through them. 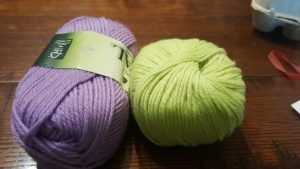 This wool is for our 2nd granddaughter’s cardigan. Her favourite colours are purple, green and white. I might incorporate white in the buttons. 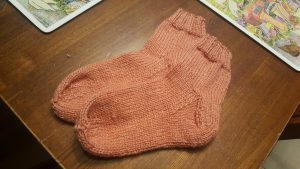 I really enjoy knitting for our family and friends, so once I’ve finished the cardigans and vest I’ll be looking at socks again, they are a great gifts. We started out the week with our no 2 daughter down and out with some virus, and it took her a couple of days to get back on her feet, and her throats still a bit sore still. So it slowed us up a bit but it has been a good week for our no 2 son as he has got to go work with his dad a bit and is learning lots of stuff about plumbing and windmills and truck engine stuff. He’s been so excited to go with that he’s been doing his other school at night before he goes to bed which has been a good thing to see. Piano practice is still going on and the eisteddfod is looming closer and closer, their duet is still not together but that’s our plan for this coming week, once they’ve got it together it won’t take them long to get it good. We had our book group this past week and we’ve just completed Strategy 3 on Our Identity in the book Fervent. It has been a few weeks since we’ve gotten together what with Easter and school holidays and it was good to meet again. It’s also good to look at who we are in Christ and how satan tries to steal our identity from us and make us feel worthless. We are daughters of the King and it’s important for us to stay grounded in His word and in prayer; that’s how we combat our insecurities, only through Him can we feel whole and our value comes from Him. I also got to meet with my dear friend this week and we’ve been studying submission. It’s a hot topic but we are enjoying it and it’s a good thing to really look at what God’s word says. We shouldn’t behave or react out of emotion but should use the word of God to guide us and enlighten us. We’ll meet again this coming week and will continue on this topic, it’s amazing what we are reading and learning. My husband was busy on Saturday afternoon harvesting potatoes again as we have used or sold out of them. 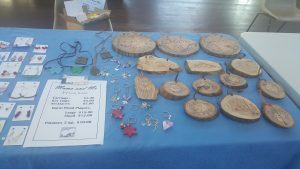 They are now in bags on our market stall and it’s a good feeling to have it done again. Thank you everyone for stopping by and linking up, I hope you had fun visiting. This week we’ve got singing lessons and that’s it until Friday. It’ll be nice to be home and get some more work done. Our no 2 daughter and myself are doing another market in a couple weeks so we’ve got some work to do for that and there’s the usual stuff as well. 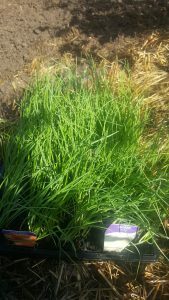 Our chickens are growing well and we’ll be looking at selling them off in about another 4 – 5 weeks, we’ve also got some piglets that will need to go around the same time. We’ve got a butchery session in a few weeks so I should think about making a couple of meals and freezing them so that I’m prepared but we’ll see how I go with that. I’m meeting with my friend on Friday and then the children have their Bible Class and it’s piano lessons on Saturday, and I want to get some knitting done and plant the garlic as well. With the weeks going by so quickly it’s easy to loose our focus and get caught up in hectic lifestyles that leave little time for God and family. I’d like to encourage you (if you are struggling with focus) to take time to spend with God and in His word. Focus on all He has done for you and given you and have a thankful and repentant heart. What sort of week have you all had? Has it been productive, quiet, running around busy??? I’d love to hear from you all. We’ve had a good week and we’ve been busy in the raised vegetable gardens. 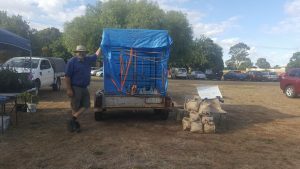 Earlier in the week our no 2 son helped me and we pulled out and harvested all the capsicum plants to make way for our onion seedlings which we planted later in the week. 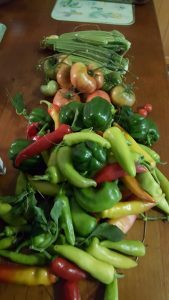 We had a fantastic capsicum crop this year with plenty dehydrated and put away for the coming winter months. I think that we planted over 100 onions with half being white and the other half brown. I’m excited about this and it’ll be very important to keep the weed growth to a minimum. 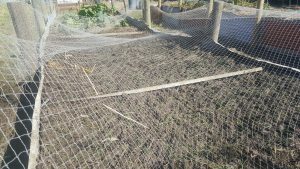 Seedlings planted and netted to keep the magpies away. We had singing lessons this week and the children have chosen their pieces for the local eisteddfod in June. They haven’t sung at an eisteddfod before so they are a bit nervous, there isn’t a piano to hide behind when you just sing. They are doing really well though and it’ll really help their confidence. We’ve been doing school and music practice as well this week, it’s really been just a normal every day week until we got to the weekend. 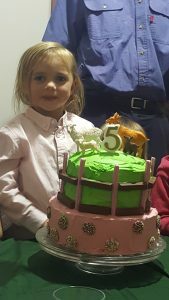 On Friday night we all went up and visited our son-in-law, daughter and their children for our oldest granddaughters 5th birthday. It was great fun and good to see them all again. The other grandparents and aunts and uncle were there as well so it was a big family do. It’s so nice that we can all come together and enjoy our fellowship. We stayed one night and came home on Saturday afternoon. It was a definite highlight of our week. Thank you for linking up last week and I look forward to seeing you again this week. This coming week is just like the last one with music lessons and we do have our book group this week so that’ll be nice. We’ve had a long break due to Easter and school holidays so it’ll be great to get together again. I hope to catch up with my friend again this week, but we’ll have to see how that goes. It’s been a hard week for a couple of our married friends with the falling apart of their marriages. We need to keep vigilant and aware that satan wants to destroy Christian marriages. I was told of some excellent marriage counselling advice – men you are called to love your wives and wives we are called to submit to our husbands. I know that is not a “modern” way of thinking but it is Biblical truth and we need to stand on that and not be part of the world’s thinking. On that note I pray that you all have a great week!!! Well another week has gone by and the weather has gone from warm and humid to wet and cold. 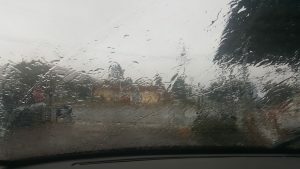 It’s been quite a warm and dry Summer/Autumn so the rain is very welcome. It rained most of Saturday and the weather was not much over 12 degrees C for the day. I planted some more seedlings on Friday and the raised beds had started to dry out but it’s not an issue any more. We had some good friends stay with us on Tuesday night. They used to attend our church and are now on a journey of learning to become missionaries in Africa. This journey will probably take them around 5 years but they are dedicated to God’s calling on their lives. They are good fun so it was lovely to have them around for a little bit and we enjoyed some deep conversations as well. They are such an inspiration. Our no 2 daughter helped with a Bible Kids Club on Wednesday morning and I was able to meet up with my friend. We are busy catching up on our lives at the moment and we’re hoping to get back to our Bible reading this coming week. So much has been going on it’s hard to stop talking to each other. 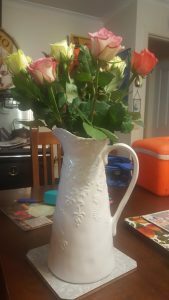 A good friend gave me this beautiful jug for my birthday so I was thrilled when my husband brought me home these lovely roses to put in it. They look so nice in the kitchen. With the warmer Autumn weather we’ve been having the garden has still been producing. 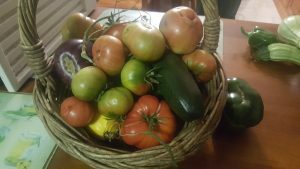 This week I picked tomatoes, zucchinis, capsicums and one lonely eggplant. The homegrown tomatoes taste so much better than the bought ones. With the change now to much colder it will be interesting to see how the garden finishes off. I need to wait for the pumpkin vines to die off before picking what pumpkins there are. The artichokes are still growing and I’m about to pull out the capsicums and zucchinis so that I can plant garlic and onions. I planted more broccoli and cabbage seedlings this week along with lettuces and beetroots. Saturday my husband and no 1 son went on a camp with some other men and their children. It was just as well there was a hall to bunk it as it wouldn’t have been much fun outside. They had a good time but it was nice when they got home. Welcome to any new bloggers linking up, I hope you enjoyed your visit and thank you all for taking the time to stop by. School holidays are now over and it’s back to the hustle and bustle of school term. We have singing and piano lessons this week and my husband is busy with the Father’s course as well. The children’s Bible study will start again this week and I’m looking forward to catching up with all the mothers while that is on. I’m home most of the other days and we’ll be continuing on with school and music practice. There will be gardening getting done and animals to feed and look after as well. I’m now onto preserving apples so that’ll be high on my agenda this coming week. I will probably stew and bottle most of the apples and dehydrate slices as well. They are a great snack to nibble on. Okay my friends, it’s been good to be here and I hope you have a great week! After the fires on the weekend we were quite worn out and everyone has been a bit edgy as well, due to the continuing weather conditions. We were blessed on Monday though when we met up with our No 1 daughter and her children in town and had lunch with them. Our daughter had been to a Ladies talk in the area so she was close by. We had a lovely time together for a couple of hours and then we all dispersed to our own homes. My husband has been busy with the Father’s course that he is running and at the moment he is out 2 nights per week but he is enjoying it and it is great when the men take hold of being the heads of their families and start building on their relationships with their wives and children. It’s a great course to be involved with. I was blessed this week to be able to meet up with my friend and catch up with all her news since shes been away, we then had our church’s ladies mission group, which was great. Our book group met on Thursday and we have just finished Strategy No 2 – Our Focus. We are all enjoying the book and learning to be strategic and direct with our prayers, once again I would encourage everyone to read Fervent and watch War Room, it really opens our eyes to prayer and changing our prayer life. From Friday on it is usually busy and this week was no different. Friday night the children had their Bible Class and because it was the last one of the term they made pizzas. They really enjoy this time during the week and getting together with their friends and learning about God, and I love meeting up with the mothers and catching up on all their news and encouraging each other. Our son-in-law, daughter and their children stayed over on Friday night but got in very late, so we didn’t see them until we met up with them for breakfast in town after the children’s piano lessons. It was a wonderful noisy time and it was great to see them and the children again. Then it was just our no 2 daughter and my husband and I home for the night because our no 1 and no 2 son went to their sister’s house for the night via some 4wd tracks. Sunday was church and we had lunch with a couple of other churches in town. That was a nice time and enjoyed by all. I APOLOGISE AGAIN ABOUT NO TOP 3 DUE TO OUR INTERNET. This coming week is the last one before school holidays and Easter. The children have singing lessons on Tuesday and I hope to take a friend out for her birthday on Thursday. My husband has his courses as well and our no 1 son is going away for Easter. It’s full on trying to keep up with what everyone is doing :-). We are having a Church BBQ here on Easter Sunday, a relaxed afternoon and then the following week I would love to get in and try out the pottery wheel my family gave me for my birthday. Have a great week my friends and again I encourage you all to remember who your best friend is – Jesus, speak to Him, praise Him, He listens, He cares and He will never leave us – It’s all about Him. How was your pre-Easter week? I am writing this on Saturday because we’ve got some of our church family here for lunch on Sunday and I don’t think I’ll get time after that. It’s been a busy week but a good one. The children had singing lessons and have been working on what pieces they are going to perform at our first Eisteddfod this year. This is the first time they have sung at an Eisteddfod so they are a bit nervous but their older sister is going to accompany them so that should help a bit. I was able to take one of my good friends out for lunch this week for her birthday and we had a really nice time. She brought her daughter and grandchildren along and another friend came as well. It is so nice to get together with our Christian sisters and encourage and love each other. I gave her some socks for her birthday and I was really pleased with how they turned out. I didn’t get them finished until really late (early morn) the night before so I’ve started a pair for another friend for her birthday in May so I’ll be well prepared the next time. We have three granddaughters with birthdays in April and May so I need to get onto some for them as well. I was thinking of making them a cardigan each but I’m not sure if I’ll have time or not and I need to finish one I’m making for their mother (no 1 daughter) as well. I usually knit after tea and I really miss it if I don’t get the time then, it finishes the evening off nicely. The summer vegetable garden is finishing off and the zucchinis have slowed down but I’m still getting a few each week. 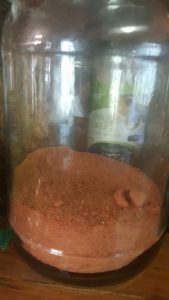 I was blessed with another load of tomatoes this week and I’ve got some dehydrating at the moment along with some garlic that I had already harvested. The kitchen sort of smells like pizza :-). 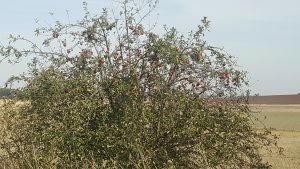 My husband and our no 2 daughter picked nearly 100 kgs of apples last week from road side trees. That’s the next job I’ll need to get into and if I do a load each day or so I should get them done easily before they rot. We had an awesome Good Friday service yesterday and an absolutely amazing sermon from our minister. He definitely didn’t pull any punches as to what Jesus did for us and the strong reminder that we are in a battle and that Jesus came to deliver us from the tyranny of the devil. We all fall short and that gives the devil claim over us, we are sinners and we have guilt and that’s his no 1 weapon. There is one man in history over who the devil has no claim whatsoever. Jesus never gave in, he never sinned and he took the judgement of our sin and set us free. It is so nice to get back to the top three after a couple weeks of extremely slow internet. Thank you everyone for linking up and I hope you enjoyed your visit. Tomorrow as I said before we’ve got some church family here for a BBQ lunch which we’re all looking forward too. Our no 1 son is away for Easter but he’ll be back late Monday night. This coming week is technically school holidays but we do have a piano lesson and we will keep schooling as well. I’m hoping I can catch up with my friend and do our Bible study while the children play and we’ve got visitors for lunch next Sunday as well. Lots of cooking and fellowshipping this week, but that’s good. May our risen Lord come to you and give you the peace and knowledge of your redemption through Him. As I am writing this it is blowing an absolute gale outside and there is so much dust and dirt as well, it is quite awful. We are holed up inside waiting for it to pass so hopefully by the morning it will be calm again. They are predicting rain tomorrow and that would be wonderful as it’s been quite a dry start to autumn and a dry summer. We’ve had a good week and it’s nice to look back to see what we did, sometimes I have to look in my diary because I can’t remember ;-). The children and I met up with a friend and her daughter at the park for lunch and a chat earlier in the week. It was a lovely time and I’m enjoying how our friendship is developing even though I am old enough to be her mother, quite amazing really. The children had singing lessons as well and then I was home for the rest of the week until Friday. 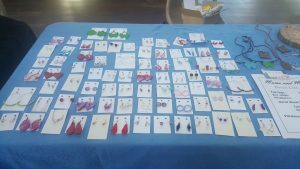 Our no 2 daughter was asked to do a fundraising market for our local hospital so she was busy making jewellery all week. That kept her busy all week and after encouragement we are thinking of opening an Etsy store so that she can sell them on line. They are very good and she has a good eye for colour and flair. My lovely husband gave me a wood burning tool for Christmas and I managed to get some wood burning done for the market as well. Wood burning is good fun and my husband cut discs of timber from our own tree branches and sanded them up for me and they hang with a leather cord. My husband also took some laying hens and potatoes to sell and he did quite well too. He has a great way with people and can talk to anyone, he’s just great. Our no 1 daughter’s mother-in-law blessed us with a couple boxes of tomatoes, zucchinis and cucumbers so I got busy this week and dehydrated some tomatoes and our own capsicums. I then powdered them together and put it in a jar. It does go down to nothing but you don’t need to add too much to get flavour into a casserole or soup. A final note to this week, my husband spent Saturday night at a fire not too far from us. They lost 4 – 5 houses and it’s not quite under control yet. Our no 1 son left this morning to relieve the night crew and should be home shortly. There were concerns for our side of town due to a very strong westerly wind change that was due this morning but it turned out not to be as bad as predicted so we are safe. Please pray for those families that lost their houses and those that lost their stock, sheep and cattle. There are still concerns for the main fire and they now have aerial support which will be helping. We’ve got tree branches down all over the place and the wind even flipped our trampoline but except for some fence issues we haven’t got any damage. Due to our amazing internet I won’t be able to do a top 3 this week, so I apologise again. This coming week is a busy one with our churches women’s mission group meeting on Wednesday and my friend who I meet with to read the Bible is back and we are getting together this week. I’m so excited about that as I’ve really missed our time together. We’ve also got our book group and then the usual stuff for the children. That’s it for me this week and I look forward to hearing from you all. May God bless you this coming week, may you feel His presence in your daily lives.